Europe’s favourite-ish pop star XNTHONY is back. This time it’s personal. This time he’s getting hitched! Having failed to represent anyone in the Eurovision, XNTHONY is pivoting. Out goes the glitter and glam. In comes wife-to-be Tiffany. Standing together with sweaty palms and open hearts, this is the white wedding of the millennium and the couple want you to join them on their special day. Support for the project comes from Limewharf Creative Hub and Roscommon Co Co. Image by DASHIELL SILVA. Photography by LUXXXER. THE POWER OF WOW recently premiered at Dublin Fringe, Powerscourt Theatre, and was nominated for Bewley's Cafe Theatre's Little Gem. 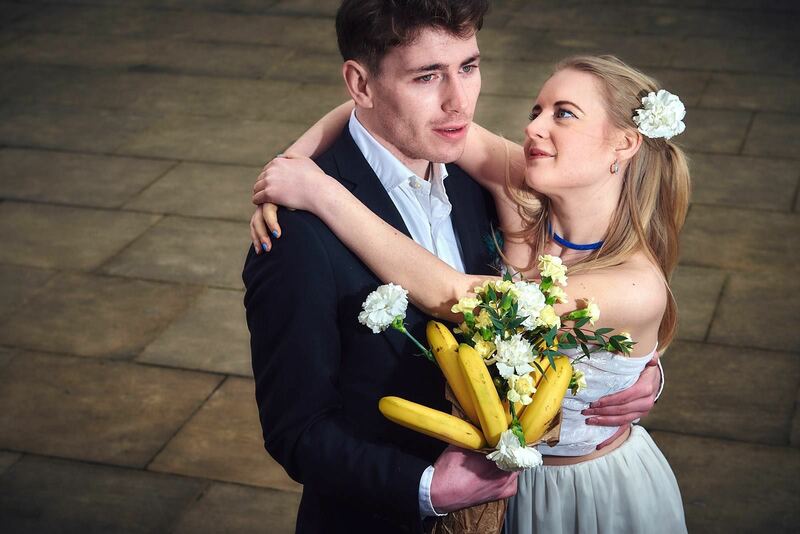 ‘This production is an engaging and challenging progression of the characters of Xnthony and Tiffany (who previously appeared in Douze) that involves the audience in both light-hearted and provocative, searching ways. The Power of Wow is a brave (and at times bizarre) work of art that is not afraid to push boundaries and does so with confidence, conviction, and bananas.’ Read more here. ‘During such stunts, the electric Tiffany Murphy will up the ante, even grinding melisma into his thoughtfully prepared rap. It’s clearer than before that Xnthony is a scathing ridiculer, showing the ugly side of celebrity culture. Through grotesque routines, Tiffany is pushed to the brink before finally railing against what she was promised. This cabaret act has some teeth.’ Read more here.